In 2017 there were 5.7 million international overnight visitors. Tourism generated $18.4 billion in revenues in 2017. The tourism and hospitality industry is labour intensive, employing approximately 302,700 British Columbians. Of these, approximately 137,800 are employed as a result of visitor spending. There are more 19,000 tourism-related businesses in British Columbia. More than half of these businesses have less than 10 employees. The wages and salaries paid to the 137,800 workers supported by visitor spending was $4.9 billion in 2017, up 4.0% from 2016. Getting more background information on the industry will help you to better position your business as you move forward or help you to identify the wealth of career opportunities. In this section you will learn about the size, scope and structure of the tourism industry in BC, including how tourism benefits our economy, industry and product development, and BC’s tourism workforce. Download, print and share these infographics. 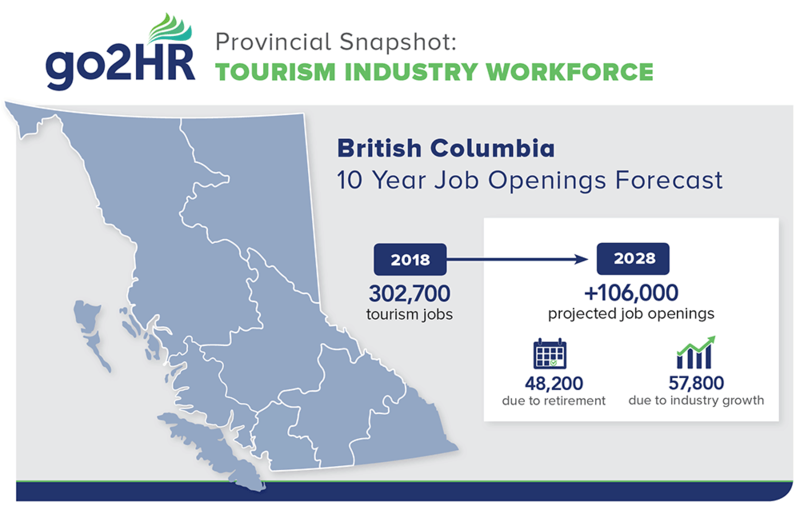 We have created a double-sided provincial snapshot along with half page double-sided regional snapshots of BC’s Tourism Industry Workforce. Use this as a reference to learn about our industry at a glance: What is our 10-year forecast for employment openings? Or how does our workforce compare to other industries? Take a look below. We plan to update these annually when we receive the new labour market information every fall.